Modern Cooperative at 1215 W. 18th St. in Pilsen will close by the end of summer, its owners said. PILSEN — After five years in Pilsen, vintage furniture and decor shop Modern Cooperative will close its doors this summer, the shop's owners announced late Sunday. Owners of the high-profile shop, known for its midcentury modern home furniture, decor and gifts, plan to close the Pilsen store at the end of August and focus on their shop in Hyde Park. The 18th Street store "is no longer financially stable" after rent hikes and a decrease in sales, co-owner Tiffany Paige said. "It’s been an amazing five years in Pilsen, and we hate to say goodbye to the neighborhood, all the friends and supporters we’ve made over the years," Paige said. “Unfortunately, this location is no longer financially sustainable for us due to multiple rent increases combined with a decrease in store traffic and sales." Modern Cooperative opened in May 2012 in a storefront at 818 W. 18th St. before moving into one of Thalia Hall's three retail spaces at 1215 W. 18th St. in September 2013. 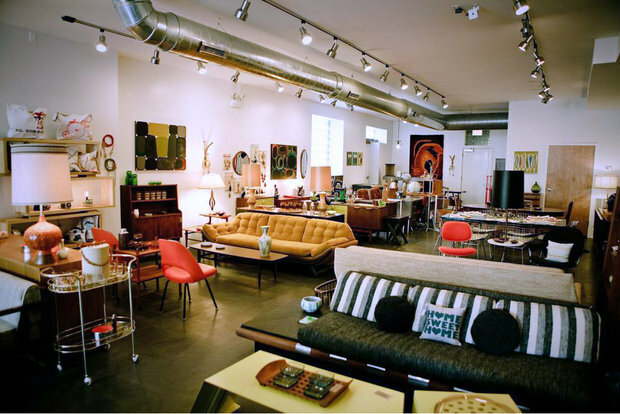 In November 2014, Modern Cooperative owners expanded the shop into a neighboring storefront in Thalia Hall, offering 4,500 square feet of vintage furniture, clothes and gifts. The expansion of the shop made Modern Cooperative one of the largest vintage and handmade boutiques of its kind in Chicago, Paige said. Modern Cooperative opened its second location, a 2,400-square-foot store at 1500 E. 53rd St. in Hyde Park, in October 2015. Starting this week, the Pilsen Modern Cooperative will only be open Fridays and Saturdays. As the end of summer nears, owners plan to host a series of closeout sales and eventually transfer the remaining inventory to the Hyde Park store. While sales at the Pilsen shop have slowed, Modern Cooperative Hyde Park is thriving at 53rd and Harper. “The ModCo Hyde Park store was busy the first day we opened and continues to thrive with the assistance of the University of Chicago and the warm and welcoming people of Hyde Park," co-owner Mike Biersma said. "This decision to streamline will allow us to invest more of our time and energy here, as well as focus on our online presence." Thalia Hall owners could not be reached Monday morning.